It is always a pleasure to share positive news about individuals stepping up to help their communities. After December’s massive storm which caused record-breaking damage throughout the Lower Mainland, it was the seaside community of White Rock which suffered some of the most lasting and severe damage. The beloved pier and waterfront of this iconic community suffered millions of dollars worth of damage that will take months if not years to fully repair. One of our valued tenants at our Saltaire Community decided to step up and contribute to the repairs in a significant way. 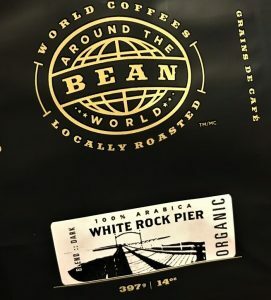 Mike Moon, owner of Bean Around the World, has developed a blend of coffee exclusive to this White Rock location with a portion of the proceeds going to restoration and repair of the White Rock pier. If you find yourself in the neighbourhood, stop in for a steaming cup of White Rock coffee and enjoy helping the community at the same time.